Third generation Florida dairy farmer Jeff Busciglio moved to Georgia with his dad, his wife, his kids and their 160 cow herd. 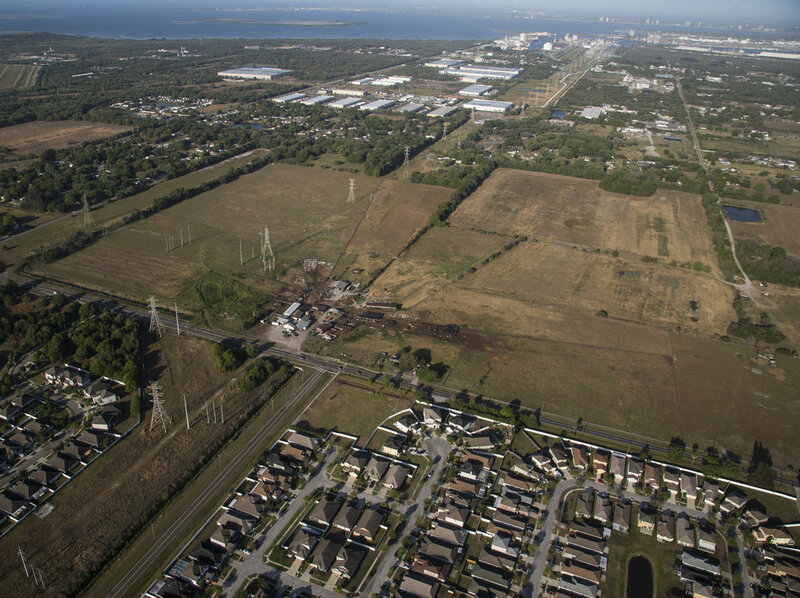 The last dairy farm in Hillsborough County, Florida, is being replaced by a housing development. The new homes will line streets named after members of the Busciglio family. The Busciglios farmed the nearly 250 acre plot, just 10 minutes outside of downtown Tampa, since 1950. Alex Busciglio, 9, lays in the calf pin at Tower Dairy, in Tampa, Florida, on March 24, 2017. Alex and his brother Dominic, 5, love spending time on the farm, calling the cows "Moo-Moo's," and riding in the Bobcat with their dad, Jeff. Jeff Busciglio looks back into the milking parlor during an overnight milking at Tower Dairy, on March 7, 2017, in Tampa, Florida. Dairy cows have to be milked twice a day, 12 hours apart. Depending on other tasks, like mixing feed, Jeff would arrive at the farm just after 1 am, to start milking the 160 cows promptly at 2 am. When working alone the milking process took Jeff about four and a half hours. When talking about farming with his dad, Jeff said, "67 years for him and 43 years for me. That's all we know." Jeff Busciglio pauses for a breath in the old dairy parlor at Tower Dairy on February 8, 2017. After Jeff and his father Sammy Busciglio built a new milking parlor, this space became a garden. When they learned that they would have to move the farm the garden fell into disrepair. The nearly 250 acres of Busciglio family farm land, as seen from the air on March 24, 2017. Tower Dairy is less than 10 miles from downtown Tampa and the last dairy farm in Hillsborough County, Florida. Although the farm used to be at the end of a dirt road, development has closed in on the property. "They offered them so much money they couldn't afford not to sell it, " Sammy Busciglio said. 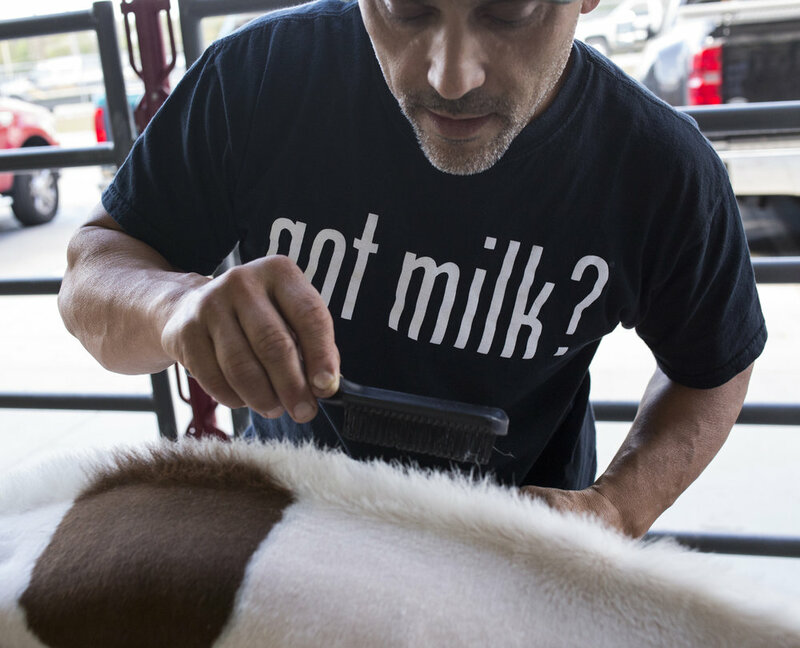 Jeff Busciglio grooms a Holstein calf before a 4H and Future Farmers of America dairy cow showing at the Florida Strawberry Festival on March 4, 2017, in Plant City, Florida. Alex Busciglio, 9, and Dominic Busciglio, 5, pose for a photo taken by their mom, Jana Busciglio, after showing Holstein calves at the Florida Strawberry Festival on March 4, 2017, in Plant City, Florida. Sammy Busciglio looks through family photographs and memorabilia in the office at Tower Dairy, in Tampa, Florida on April 17, 2017. Dominic Busciglio, 5, plays with his "Tia," Samantha Busciglio-Payne, on the last day the cows were at Tower Dairy, in Tampa, Florida, on March 26, 2017. Spiderwebs coat work tools in the shop at Tower Dairy , on March 26, 2017. The tool-filled shop is in an original barn built by Sammy Busciglio's father Joe, over 60 years ago. The dairy existed at its 78th Street location in Tampa since it was founded in 1950. Savannah Busciglio, Sammy Busciglio, and Samantha Busciglio-Payne ride on a tractor back to the barn at Tower Dairy, after taking a family portrait on March 26, 2017. Savannah and Samantha are Sammy's daughters. "I wish there was some way we could buy it," Sammy said, referencing the family property in Tampa. "We could make it a showcase place. We could make it a place where we could teach children where milk comes from." 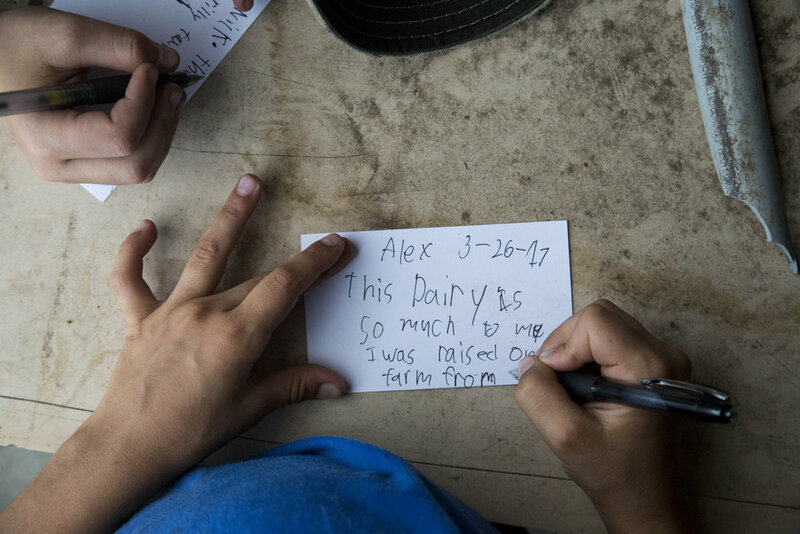 Jeff's son, Alex Busciglio, 9, writes a note for a time capsule that the Busciglio family hopes to leave buried somewhere on the Tower Dairy property in Tampa, on March 26, 2017. 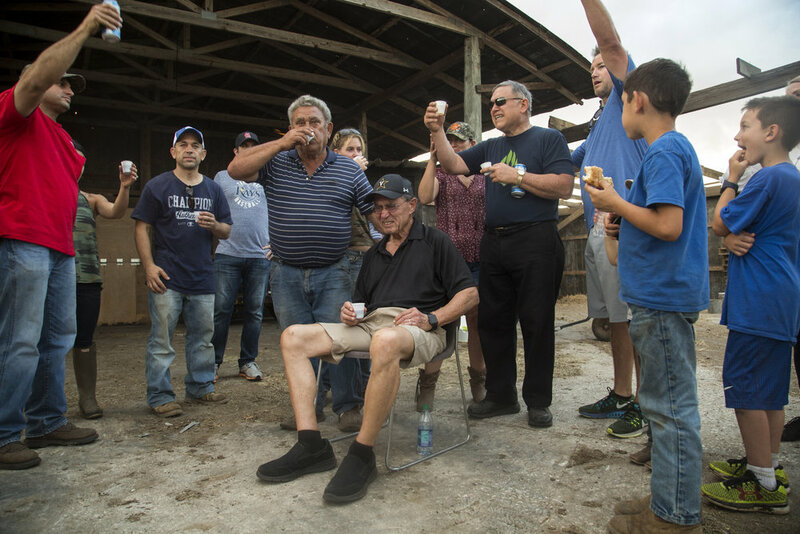 Sammy Busciglio (left of center), his two brothers and extended family toast to Tower Dairy and the Busciglio family with wine and Busch beer, on March 26, 2017, the day before the cows were moved to Georgia. Sammy's father Joe Busciglio loved to drink Busch beer. Although Jeff and Sammy own the dairy, the property was owned by a larger group of family who were ready to sell. Jeff Busciglio hugs his son Alex Busciglio, 9, while his sister Samantha Busciglio-Payne, leans on this shoulder, after a family toast to Tower Dairy got emotional, on March 26, 2017. The old milking parlor at Tower Dairy in Tampa, after Jeff and Sammy Busciglio took the roof and salvaged other parts and pieces for use on their new farm in Georgia, photographed on April 17, 2017. Sammy Busciglio drives a truck loaded with feed troughs, calf pins and bales of hay north on I-75 from Tampa to the new farmland in Gay, Georgia, on March 27, 2017. The new property is 270 acres, and the family hopes to expand their herd. Jeff, Alex, 9, Jana and Dominic Busciglio, 5, walk up the hill towards the new dairy barn, after all the cows had been moved from Tampa to the property in Gay, Georgia, on March 27, 2017. It took four 18-wheelers to move the 160 cow herd. After arriving on the farm with the cows in tow, Jeff said, "I told ya it was nice."